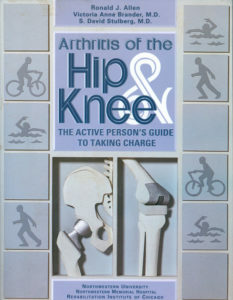 Arthritis of the Hip & Knee – Peachtree Publishing Company Inc.
A comprehensive easy-to-understand handbook that empowers patients by allowing them to take control of their treatment and recovery process. This book highlights the recent substantial advances made in the treatment of osteoarthritis of the hip and knee. It encourages patients to take charge of their situation: to actively participate in the decision-making about their treatment and to become and stay physically active. The book is the collaborative effort of three people—a patient, an orthopedic surgeon, and a physiatrist—each contributing valuable insight into the treatment of osteoarthritis and the rehabilitation process. Ronald Allen is a graduate of the University of Michigan and a professor at Northwestern University School of Law. Both before and after his hip replacement operations, he has lectured all over Europe and in Australia and New Zealand. He lives in Illinois. S. David Stulberg, MD, is a professor of orthopedic surgery at Northwestern University School of Medicine. He lives in Illinois. Victoria Anne Brander, MD, is a professor at Northwestern University School of Medicine. She was the director of the Arthritis Center at the Rehabilitation Institute of Chicago (RIC). She lives in Illinois.